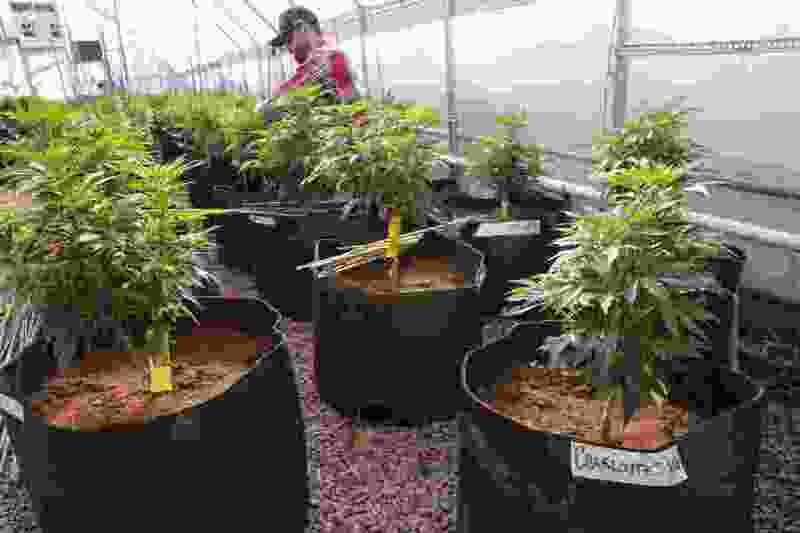 (Brennan Linsley | Associated Press file photo) In this Feb. 7, 2014, file photo, a worker cultivates a special strain of medical marijuana known as Charlotte's Web inside a greenhouse in a remote spot in the mountains west of Colorado Springs, Colo. Yet Plumb’s claims go too far. For one, while smoke certainly can damage furniture and walls within a home, current rules in Utah and other states allow landlords to prohibit smoking. Presumably, renters with medical marijuana licenses will still be bound by these rules, making any otherwise legitimate property-based objection Plumb raises null and void. Other forms of medical marijuana, like vaping or food infused with THC — marijuana’s active ingredient — can strike a balance between the right of religious people to protect their property from damage and the rights of individuals to protect their health. In addition, renters can still be penalized for damages that occur from smoking inside an apartment or rented home, no matter what is smoked. Given these protections, landlords still maintain control over their rental properties even though they cannot refuse to rent to medical marijuana patients. In fact, the requirement that landlords rent to medical marijuana patients is meant to make the law consistent with other anti-discrimination laws that landlords must comply, with like the inability to refuse to rent to people for their race or sexuality. Unless opponents of the initiative similarly believe these rules also violate their religious freedom, and therefore disagree with past actions by The Church of Jesus Christ of Latter-day Saints, it seems medical marijuana is unlikely to be a threat to their rights. Aside from worries about religious freedom, it is clear that current regulations on cannabis are far too stringent. It is classified as a Schedule 1 drug under federal law, placing the substance in a restricted category above much more dangerous drugs like cocaine and methamphetamine, which doctors sometimes prescribe. Marijuana’s current legal status in federal law actually assumes it has no recognized medical uses, despite mounting evidence to the contrary. This makes additional research on marijuana difficult to conduct, as the Senate Appropriations Committee found in June and Sen. Orrin Hatch spoke out about in April. Medical marijuana laws allow for more research on the health effects of the drug and give sick people another avenue to improve their well-being. They are in no way an infringement on the religious beliefs of anyone who disagrees with marijuana use. In short, if you believe medical marijuana violates your private religious beliefs, then don't use marijuana products. To extend private religious beliefs into the public sphere clearly violates individual liberty far more than any medical marijuana law ever could. Josh T. Smith is a Young Voices contributor who lives in Logan, Utah. You can follow him on Twitter @smithtjosh.